NYPD Authorized Uniforms & Gear NOTE: MUST BE AUTHORIZED LAW ENFORCEMENT to purchase these items. Please fill out the "CONTACT US" Link and send us a copy of your credentials or call us. Tact Squad Uniforms - Authorized LAPD Uniforms and Gear NOTE: MUST BE AUTHORIZED LAW ENFORCEMENT to purchase these items. Please fill out the "CONTACT US" Link and send us a copy of your credentials or call us. CHP Authorized Uniforms & Gear NOTE: MUST BE AUTHORIZED LAW ENFORCEMENT to purchase these items. Please fill out the "CONTACT US" Link and send us a copy of your credentials or call us. Tact Squad Uniforms - LASD Authorized Los Angeles County Sheriff's Office Uniforms and Gear NOTE: MUST BE AUTHORIZED LAW ENFORCEMENT to purchase these items. Please fill out the "CONTACT US" Link and send us a copy of your credentials or call us. ARIZONA DEPARTMENT of PUBLIC SAFETY - AZ DPS State Police for the State of Arizona. 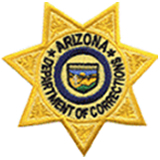 ARIZONA DEPARTMENT OF CORRECTIONS - AZ DOC NOTE: Must be authorized to purchase items. Please fill out the "CONTACT US" Link and send us a copy of your credentials or call us. If you are NOT authorized please DO NOT attempt to purchase, NO CREDITS for UNAUTHORIZED ATTEMPTS TO PURCHASE. California Dept. of Corrections If you want something not shown, give us a call toll free at 1-877-670-GEAR(4327) and we'll be glad to assist you. You may also email us with a question at: INFO@DavesUniforms.com. NEW JERSEY DEPARTMENT OF CORRECTIONS - NJ DOC NOTE: Must be authorized to purchase items. Please fill out the "CONTACT US" Link and send us a copy of your credentials or call us. If you are NOT authorized please DO NOT attempt to purchase, NO CREDITS for UNAUTHORIZED ATTEMPTS TO PURCHASE. Uniforms built to perform under the tuffest conditions and offer several color combinations to fit every job. They are worn by numberous public safety and government employees all over the country. TRU-SPEC MILITARY UNIFORMS for all your military, law enforcement, hunting, fishing or just plain durable gear. 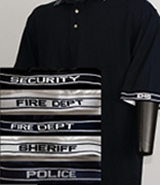 These are Public Safety Polos for POLICE, SHERIFF, EMS, FIRE DEPT and SECURITY. These Polos have the Text woven in the sleeve cuffs and the back of the neck collar. We can even Embroider your Name and / or Badge on the front to further Identify you and your Department.